SmartQ started out with a simple ambition. The company hoped to provide children aged between 5 and 12 with a form of life skills-based supplementary education. SmartQ programmes are designed to spur children’s natural thirst for learning through engagement and analyses. By focusing on knowledge-sharing through fun and engaging means rather than rote-style education following curricula- and assessment-bound structures, SmartQ is emerging as a game-changer in the space of child personality development and grooming. SmartQ works on the basis of an effective four-fold model that supplies children with a balanced diet of mental stimulants. For instance, its module on GK tickles curiosity, while IQ tests develop reasoning. Puzzles develop competitive spirit among children, while vocabulary games teach them to grasp the nuances of articulation. Through these vehicles of learning, the company supplies children with ladders of learning to which they would normally have no access via the plain-vanilla compulsory education system. It is said that among children, nothing feeds the thirst for knowledge better than a realisation that they know so much more than their peers. So, it is with SmartQ that children find that they are able to hold their own in intellectual interactions with their friends and elders. As a result of the self-esteem stemming from this realisation, children are motivated to excel through a never-ending desire to learn. 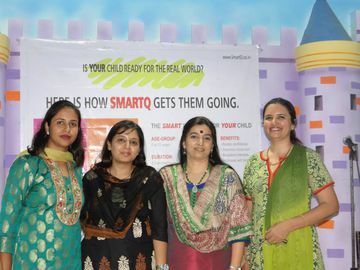 SmartQ was a brainchild of Nandini and Rajnikant Rao, veterans in the realm of education. The couple was driven by aspirations to supplement curricular education with something that would not just prove invaluable during the child’s developmental years, but later, in adult life as well. The focus was on shaping successful personalities, and not just scoring a few extra marks in a school exam. Their ambitions culminated in the birth of SmartQ in 2009. Since then, the company has successfully bagged private equity, and is presently reporting strong growth. Expanding at a healthy pace, it is seeking to establish a pan-India presence, with 80 centers in 30 towns already under its belt. SmartQ has proudly educated more than 3,000 children so far, and is impassioned to bring thousands more into its fold soon. Mumbai-based franchiser/educator, Meghna, has been with SmartQ for more than eight years now. “I was there when the idea of SmartQ was conceived. I am so proud to see a gem of an idea become this hugely successful education company. I feel so happy to see so many successful SmartQ franchises and I want to tell them that they are moving in the right direction,”says Meghna. Today, SmartQ is signing up more and more partners (/instructors/franchisers), who are realising that alternative approaches to personality development and wholesome, extra-curricular excellence is the way forward for the Indian education sector. Although SmartQ has several male franchisers, more and more housewives are increasingly picking up franchising opportunities with the company because of the flexibilities it offers them. Given that the Indian education sector is on an upswing, more and more parents are seeking education services that can enrich their children in more lasting and meaningful ways. In this context, SmartQ is emerging as the next big thing in supplementary education. So, it’s only natural that a franchise in this segment of early childhood education will find success. For housewives who will never have the flexibility to take up full-time jobs, this is an unparalleled chance to add value to the world in a meaningful way while supplementing their family incomes. If teaching and being around children appeals to them, they will find becoming a SmartQ franchiser a suitable means to gain an extra income at their convenience. SmartQ is proud to have provided countless women with such an opportunity for empowerment; the company hopes to bring hundreds more under its fold going forward.